For enterprise customers and hosting providers, the challenge of Virtual Private Networks for mobile users requires an easy-to-use, centralized and flexible remote access solution. 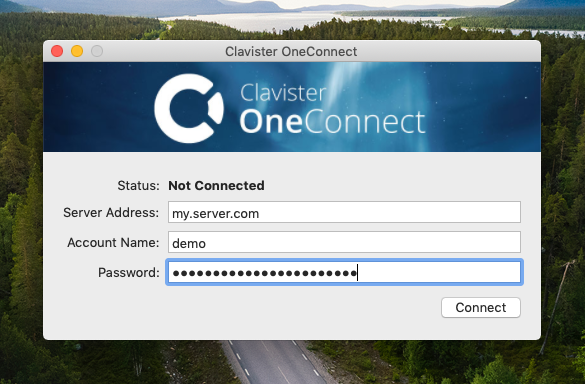 Clavister OneConnect is our SSL VPN Client that offers a simple and easy to use solution for remote access using the Clavister’s Next-Generation Firewalls. Connecting securely is as easy as utilising our built-in provisioning portal in our NGFW, downloading and installing the client and you’re ready to connect. With support for Microsoft Windows and Apple macOS there’s support for a wide range of devices. A key aspect of secure flexible remote access is ease of use for the end-user, with a simple to use UI and simple provisioning, users can concentrate on working and not at setting up complex software. By levering the functionality of the Clavister EasyAccess it’s possible to do password-less authentication using the Clavister OneTouch Applications. The benefit of this is that passwords don’t need to be remembered by the user.